Every year, Innovid analyzes hundreds of millions of video impressions globally, spanning desktop, mobile, and connected TV. Our team analyzes these impressions to identify trends, insights, and opportunities. Our annual Global Video Benchmarks Report aggregates these findings to present the clearest possible picture of the state of video advertising. 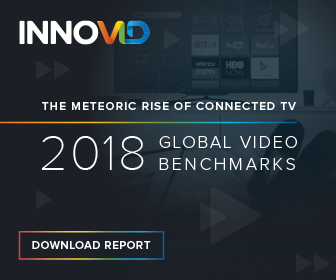 The Video Benchmarks report is designed to inform stakeholders across the video advertising landscape with insights around the performance of video and connected TV advertising on every platform and in every format, and to empower them to maximize the value of their video advertising spend. This year’s report reveals a few significant trends that will shape video advertising throughout 2019 and beyond. The biggest story of 2018 was the surge of connected television. CTV impressions jumped from 17% of all Innovid impressions in 2017 to over 28% as more consumers turned their attention to traditional television content being served up on connected screens. Estimates published by eMarkter suggest that just over 55% of all American households contain at least one connected television device. More importantly, adoption is expected to continue to grow for the foreseeable future, meaning that television advertisers will increasingly be presented with opportunities to make their messages to consumers more measurable, more engaging, and more interactive. Along those lines, 2018 was also a big year for personalization across video and connected television. In a world where personalized experiences are rapidly becoming the norm in both the digital and physical worlds, advertisers had no intention of being left behind. The last year saw marketers increase their use of dynamic video to build more personalized campaigns. Dynamic video use increased 79% in 2018 with the average campaign producing 12,000 unique versions of each creative asset powered by everything from location and weather to first-party data. The largest campaigns featured as many 200,000 unique assets. Our findings make it clear that connected TV will continue to occupy an increasingly large slice of the media mix. CTV is poised to reach over 60% of American households by 2022 and marketers are increasingly embracing the new opportunities to go with it. In 2018 they opted in record numbers to make their television advertising more engaging, more measurable, and more interactive through the introduction of advanced video advertising units and dynamic data-driven video. For marketers that make use of these new capabilities the benefits could be a more direct personal connection with consumers, and the ability to retain consumers attention outside of the traditional 15 and 30-second spots. To learn more, and to see all the 2018 Video benchmarks download the report here.